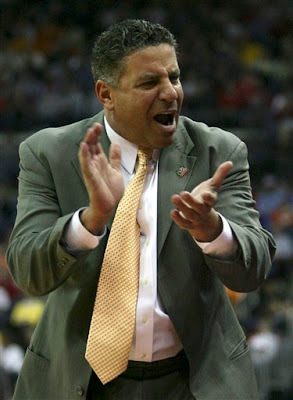 Here's my friend, Bruce Pearl, Head Coach of the Tennessee Volunteers Basketball Team. A master encourager, I use to have him talk to my staff and to clients about the connection between winning at basketball and winning at business and life. Last night the Vols went down in defeat to the Louisville Cardinals, who have an assistant that is a son of another good friend of mine, and boyfriend to my best friend's daughter. Not being a Hoosier fan, (I originally hale from Illinois) I was pleased to see both teams in the hunt. I must confess; however, that once touched by Bruce Pearl, his magnetism pulls strongly over the mountains in Knoxville to wherever you go. Payton Manning didn't even make me a Vols fan. The secret to Bruce's success is that he believes that losing is part of winning. This philosophy brought an obscure team the Division II NCAA championship twice. That team, the University of Southern Indiana Eagles, is from right here in Evansville. Their winning ways are gone now, so is Bruce. Before Bruce, the Vols where known for basketball through their successful Ladies program. Now, Bruce has brought his winning ways to Knoxville and has created the best men's team that Tennessee has ever seen. Yes, they lost last night; however, you can bet that Bruce and the Vols will be back in the hunt for the National Championship next year. And knowing Bruce, he's already figured out from this loss how to win! I have about 3 minutes of time to a computer at the B & B so I went to our log first, of course. 1. I'm a USI Grad. 2. Bruce is one interesting guy. 3. My daughter Amy is in her final year at U of L and (up until this year) played in the marching band and the pep band for the Cards. You've got to love The Big Dance.